The month of July has seriously been the busiest month of my entire life. I went to visit my sister in Tuscaloosa, Al. I went on vacation to Seagrove Beach with my family. I took an 8 week graduate statistics course that ends today. I had fun. I stressed a lot. I am glad to say it’s over! Bring on August! My older daughter is starting kindergarten. I am starting my second year of grad school. Life’s good. 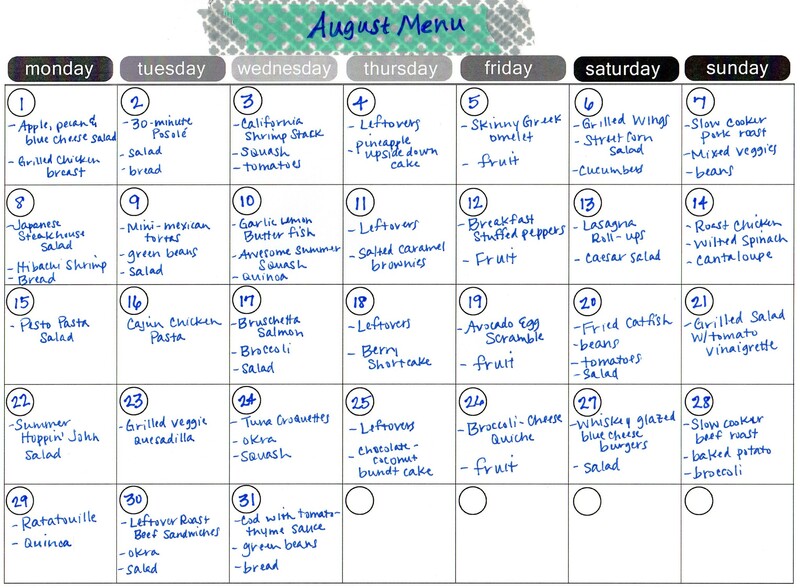 Here’s what we’re eating for dinner in August. Find the recipes on my August 2016 Menu Pinterest Board. Budgeting, where do I even start? The first time my husband and I sat down to do a budget together, I wrote some numbers down on a yellow legal pad and then promptly misplaced and forgot about it. The next time we tried to do a budget together, it looked more like Zach sitting in his comfy desk chair with an excel spreadsheet telling me what the budget was going to be while I stood behind him uncomfortably. Needless to say, our budget process had a rocky start. Luckily, we figured it out– although it was years later. As I have said before, we are Dave Ramsey fans. We use a smart phone app for our budget with a shared account, so that we can both access it from our phones. There are many, many options to choose from and I’m sure a lot of them are great, but we use Every Dollar. It’s free and it’s a Ramsey product. We start our budget with our income. You won’t have any idea how much money you can spend if you don’t know how much money you make! For many families, this should be pretty straightforward. For some, income is variable from month to month. Ours is. The way we work that is to only include the amount that’s a sure thing. We pretty much go as bare bones as possible on that. savings for an emergency fund of $1000- stop this line once you have your $1000. This system has been working for us for about a year now. It’s not always perfect, and sometimes we just mess it up. The key is to make a new budget each and every month. Do it with your spouse/partner. Keep your long-term goals in mind. It can be intimidating at first, but you can do it!! When you get home from the grocery store and all your fruits and veggies are in those little plastic bags, take the produce out before storing. Keeping fruits and vegetables in the plastic bags can cause mold and spoilage to happen faster. Start with lots of ice in a glass. Fill the glass halfway with a light fruit juice, like grapefruit juice or white grape with peach. Fill to the top with club soda. Add in pieces of fruit like strawberries, blueberries or chopped apples. Enjoy! Is today really July 1st?! Really? No, it can’t be. I feel like our summer just started. The weather in North Central Oklahoma went from 70’s and 80’s to mid-90’s overnight, and it is hot! It’s so hot, our little pool feels like a hot tub! 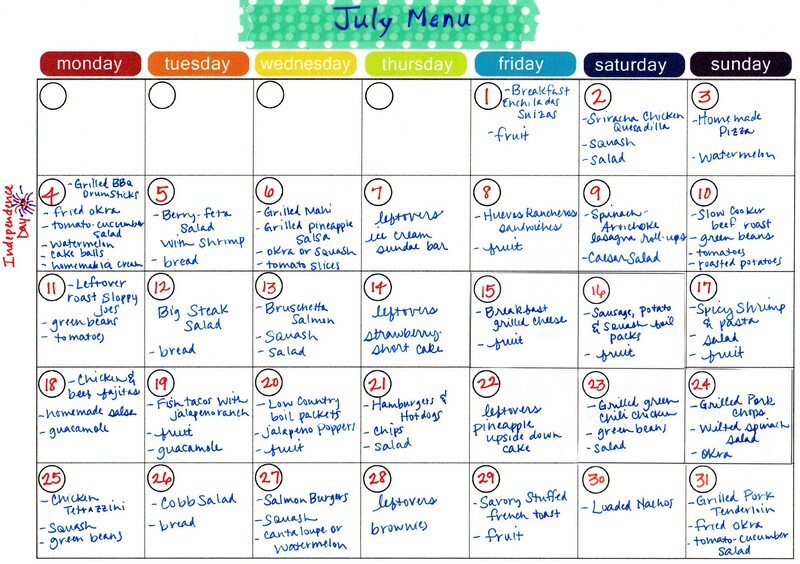 Get ready for a lot of grill recipes and cold foods because I am NOT turning on my oven this month! Well, maybe once or twice, because cake. And brownies. And pizza. I hope you enjoy this as much as I know I am going to!! If you like recipes, here’s the link to my July Menu Pinterest Board, where all the recipes are saved.